The Meigs Marauders (2-10, 1-5 TVC-Ohio) played their first game in 14 days as they faced off against the Athens Bulldogs (4-9, 4-3 TVC-Ohio). It was an impressive out on defense for Athens, as they would only allow four points in the second quarter and two in the third. The zone was too much for the Marauders and they would fall at home, 66-41. The Marauders, behind Sophomore standout Weston Baer, started the game hot and was penetrating the Athens Bulldog’s aggressive zone defense. Baer had eight points by the end of the quarter and Junior point guard Zach Bartrum played efficiently on offense. Unfortunately for the Marauders, the script would change. In the second quarter, no scoring was being produced for the Marauders by any of their players. The ball was being driven into the zone, the ball-handler found the short corner, but the shots being taken were heavily contested. Meigs could not find the bottom of the net. Along with their active defense, the Bulldogs were leaking out and getting fast-breaks and taking advantage of their opportunities. At the end of the 2nd, the Bulldogs led 33-21. Again, the Marauders struggled to fight back. Into the 3rd and Meigs’ offensive woes lingered as they would only score two points. The Marauders inexperience was evident in this game, but their offense was finding open shots but could not complete the play. Although they did not finish with a score, Coach Ed Fry of Meigs felt that they were getting the ball where it needed it to be. 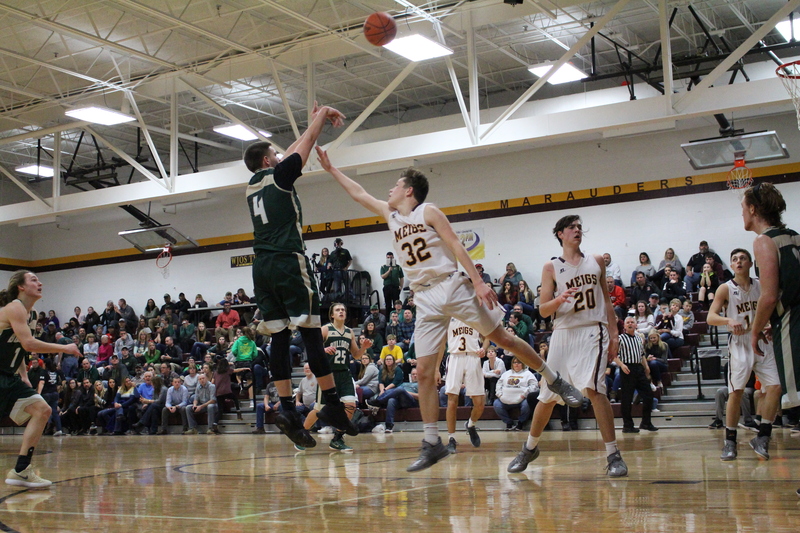 As for their defense, the Marauders were running around, causing contested shots, and forcing Athens into tough positions but the Bulldogs were still making shots. Going into the fourth, the Marauders would be trailing by 30, 53-23. In the fourth, Baer would find his stroke and try to claw his team back into the game, but unfortunately it was too late. Baer would finish with 21 points but was also 1/7 from behind the three point line. Bartrum ended with 12 points and 6 rebounds. The Meigs Marauders will play at Marietta, January 20.